Get ready for the Dota event of the year. The International 2016 is the biggest event in the Dota 2 calendar. Now in its sixth year, the stakes have never been higher: with an extraordinary prize pool nearing twenty million dollars, the winners of this week’s tournament will earn a pot that exceeds the total career earnings of top-level players in other games. Yet the prize itself isn’t the reason you should watch this year’s International. You should watch because this is one of the most exciting team esports on PC, and because every year Valve improve the production that surrounds the tournament. This is a very dynamic scene, too: Dota 2 is internationally competitive and no one region or team dominates the competitive world. Last week’s dramatic group stages were full of upsets, setting us up for a dramatic main event. This year’s winner could easily be a team that didn’t even exist last year, or from a region that has never won an International before. This guide is intended to help newcomers to enjoy the event, and to get returning fans up to speed if you’ve not followed the competitive scene closely in the last couple of months. Over the following pages you’ll find everything you need to spectate the event, along with a summary of the group stage and a beginner-friendly overview of the key heroes and items of the current ‘metagame’—the pro community’s collective sense of which characters and strategies are in the ascendant. If you’re looking for more information on the teams themselves, please check out last week’s in-depth round-up, now updated for the main event. It’s up to you how you use these resources: you can dip into the team guide when it’s relevant to the game you’re watching, or you can read it all to help you shape your predictions going into the playoffs. 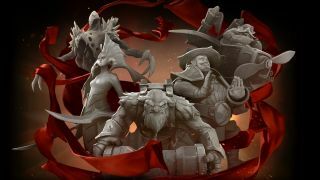 If you're looking for newcomer tips for Dota 2 in general, check out our Dota 2 beginner's guide: some of the resources listed may well help you follow the International, too. What happened in the group stage? This year’s International takes place from Monday the 8th to Saturday the 13th of August at KeyArena in Seattle, USA. Play will begin at 10:00 PDT/13:00 ET/18:00 BST/19:00 CEST every day, with the longest days taking place towards the beginning of the week. The exact timing of each match is variable because Dota 2 games have no fixed length: they end when they end. There have also been unfortunate issues with delays and DDOSing at previous Internationals, so keep checking Twitch and Twitter for updates if there’s a particular matchup you want to see. From the semi finals onwards, expect to be able to gauge the start time of matches with a little more certainty. For a full schedule, check out the official International site. You can watch the games through the ‘Watch’ tab in the game client, which allows you to control the camera yourself, pick which commentary team you want to listen to, and so on. You can also load in with a group of friends, which is a great way to watch the tournament if you’ve got buddies who share your interests. Doing your own ad-hoc cast of a pro game can be more fun than tuning into the official broadcast. This year there’s also the spectacular Dota VR Hub, if you’re lucky enough to own a HTC Vive. This allows you to watch the games on a massive virtual screen surrounded by life-size statues of the heroes being played before leaping down into the game itself to stride the battlefield like a giant: or experience it from ground-level, as I attempted last week. It can be a little tricky to follow games closely in VR, but if you’ve got the kit then you’ve got to try it at least once. Six teams were invited to the International directly, at Valve’s discretion. Then, a series of four International qualifiers—Europe, North America, South East Asia and China—provided two teams each for a total of 14. The third place teams in each region entered the wildcard, a mini-tournament that was played last week. The top two teams from the wildcard won spots in the main event, rounding out the final 16. In the group stages, those teams were divided into two groups of 8. They then played a round robin over three days with a best-of-two format. The top four teams in each group get to begin the main event in the upper bracket, and the very best among them got to choose their first opponents. Teams that did poorly in the group stage will have to fight for their tournament lives on day one of the main event in the lower bracket. The first day will see two games played in the quarter finals followed by all four best-of-ones in the lower bracket. The latter are particularly brutal, as each team—and there are some fan favourites in there—only has one chance to stay in the tournament. Expect upsets, pocket strategies, and surprises. Don't miss it. Expect all of those numbers to go up over the next week, too: for every $1 that is spent on the in-game International Compendium and Battle Pass, $0.25 is added to the pot. Last year, I measured the size of the International prize pool in killer whales. This year, the winners will be able to afford their own island in Washington state. Trump Island (no relation to The Donald) near Decatur is the perfect place to train for next year's International and will only set them back $8,750,000. If the players don't want to share, however, then their cut of the top prize is enough to get them a large island in British Columbia each. Those who drop out of the main event early will need to settle for sharing a freehold in Fiji. On the next page: the drama of the group stage.